The kingdom of Chlothar at the start of his reign (yellow). By 613 he had inherited or conquered all of the coloured portions of the map. 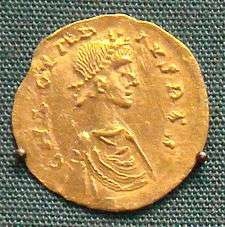 Chlothar II (or Chlotar, Clothar, Clotaire, Chlotochar, or Hlothar; 584–629), called the Great or the Young, was King of Neustria and King of the Franks, and the son of Chilperic I and his third wife, Fredegund. He started his reign as an infant under the regency of his mother, who was in an uneasy alliance with Clothar's uncle Guntram, King of Burgundy (d. 592). Clothar assumed full power over Neustria upon her death in 597; though rich this was one of the smallest portions of Francia. He continued his mother's feud with Queen Brunhilda of Austrasia with equal viciousness and bloodshed, finally achieving her execution in an especially brutal manner in 613, after winning the battle that enabled Chlothar to unite Francia under his rule. Like his father, he built up his territories by moving in after the deaths of other kings. The domain of Clothar II was located in the territorial and political framework derived from the Frankish kingdom present at 561 at the death of Clothar, son of Clovis and grandfather of Clothar II. On the death of Clovis in 511, four kingdoms were established with capitals at Reims, Soissons, Paris, and Orléans, Aquitaine being distributed separately. In the year 550, Clothar I, the last survivor of four brothers reunited the Frankish kingdom, and added Burgundian territory (Burgundia) by conquest. In 561, the four sons of Clothar I followed the events of 511 similarly and split the kingdom again: Sigebert I in Reims, Chilperic I in Soissons, Charibert I in Paris, and Guntram in Orleans, which then included the Burgundian kingdom territory (Burgundia). They divided Aquitaine separately again. Very quickly, Sigebert moved his capital from Reims to Metz, while Guntram moved his from Orléans to Chalon. On the death of Charibert in 567, the land was again split between the three survivors, of greatest importance Sigebert (Metz) received Paris and Chilperic (Soissons) received Rouen. The names Austrasia and Neustria seem to have appeared as the names of these kingdoms for the first time at this point. In 560, Sigebert and Chilperic married two sisters, daughters of the Visigoth king of Spain Athanagild; princesses Brunhilda, and Galswintha respectively. However Chilperic was still very much attached to his lover and consort, Fredegund, causing Galswintha to wish to return to her homeland in Toledo. In 570 she was murdered and suspicion fell on Chilperic, although eventually these suspicions faded. Within days, and after a brief period of grieving, Chilperic officially married Fredegund and elevated her to a queen of a Frankish kingdom. With her father's death not soon after, Brunhilda became solely responsible for reprisals against Chilperic. He agreed at first to pay a sum of money to end the feud, but not soon after decided to embark on a series of military operations against Sigebert. This was the beginning of what is called the "royal feud " which did not end until Brunhilda died in 613. The main episodes until the assassination of Chilperic in 584 were as follows: the assassination of Sigebert (575), the imprisonment of Brunhilde and her marriage to a son of Chilperic, and the return of Brunhilda to her son Childebert II, successor of Sigebert. Moreover, Fredegund strove to ensure her position, since she was from lower origins, by eliminating the sons that Chilperic had with his previous wife Audovera: Merovech and Clovis. Her own children, however, died at a very young age and appeared to be by foul play. 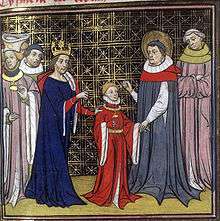 When Fredegund had a son in the spring of 584, he would be the future successor of Chilperic I, if he had lived long enough. Under Frankish customs, newborns did not receive names initially, in order not to spread concern related to the symbolic name of the Merovingian. Wanting to choose a name based on the development of unrest in the kingdom of the Franks, his father did not baptize him immediately. 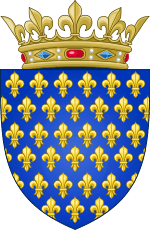 Chilperic and Fredegund desired to protect their child, since their four older sons may have been victims of murder, and there was much political intrigue at the time. He was raised in secret in the royal villa in Vitry-en-Artois to avoid detection. In September 584, Chilperic I was murdered near his villa of Chelles, perhaps on the order of Queen Brunhilda after a hunt. This event produced general disorder and unrest. In this time Austrasians plundered parts of Neustria, seizing valuable treasures and goods, as well as important documents. Princess Rigunth, on the way to Spain to marry Prince Reccared, was captured by Duke Didier of Toulouse and was linked in conspiracy with Gondovald who stole all that remained of her dowry, so that she was forced to abandon the marriage. Wars broke out between rival cities, and Orléans, Blois and Chartres stood against Châteaudun. Fredegund managed to keep most of the treasury of the state as well as key political figures, such as the generals Ansoald and Audon, although many, such as chamberlain Eberul, abandoned her. She took her son to Vitry and sent a message to Guntram, King of Burgundy, asking him to adopt the child and offer his protection to him in return for exercising his authority over Neustria until the boy came of age. Childebert II, who was at Meaux when Chilperic was murdered, considered an attack on Paris, but Guntram was ahead of him. Childebert II began negotiations with Brunhilda one hand, Guntram on the other: but Guntram refused many of his requests, including allowing him into Paris. He refused to deliver Fredegund, whom Brunhilda claimed was behind the regicide of Sigebert I, Clovis, and even Chilperic I.
Guntram convened a meeting of Greater Neustria, in which the court recognized Clothar as the son of Chilperic, although there were some doubts about his paternal identity. It was at this time that they gave him the name Clothar, naming him after his grandfather. Guntram then took legal responsibility of the child, adopting him and becoming his godfather. Ansoald was responsible for regaining control of cities Neustria had lost since the death of Chilperic. They then swore allegiance to Guntram and Clothar after their capture. Guntram, attempting to restore order in the affairs of Neustria, likely against the advice of Fredegund and perhaps to show his authority, replaced key figures in the episcopal see of the church and moved its location. Bishop Promotus of Châteaudun, whose diocese was demoted after the parish council of Paris in 573, who saw this changes as a violation of canon law, demanded his return after being exiled to the death of Sigebert I, and was thus returned much of his personal property. Two envoys from Brunhilde, Duke Gararic and chamberlain Eberon, succeeded in swaying Limoges, Tours, and Poitiers towards Austrasian influence, with the help of bishops Gregory of Tours and Venantius Fortunat. Guntram responded by sending troops to recover the lost cities that promptly returned their loyalties to Guntram and Cothar. Fredegund was sent to the Villa de Vaudreuil, in the diocese of Rouen, where she was put under the supervision of the bishop Pretextatus. During the summer of 585, Guntram returned to Paris to act as godfather of Clothar, as he swore to Fredegund, along with three bishops and three hundred nobles of Neustria who recognized Clothar II as the son of Chilperic I. However his baptism at this time is postponed. It was expected to reconvene at the council of Troyes, but Austrasia refused to participate if Guntram would not disinherit Clothar. The council is moved to Burgundy and he was baptized on 23 October 585. While Guntram campaigned to capture Visigothic Septimania, Fredegund escaped her custody of the bishop and fled Rouen. During Sunday Mass, Pretextatus was stabbed, although he did not die immediately. Fredegund attempted to fetch doctors and gain his favor. However, he openly accused her of being behind this attack and the murder of the various kings. He publicly cursed and denounced her before dying soon after. The queen then used her new freedom to rally as many nobles and bishops as could be found to her son. She was reinstalled into power despite Guntram's exile of her. Guntram then attempted to weaken Fredegund's influence by swaying some of the Neustrian aristocracy to his side, and keep Neustrian lands he held between the Loire and Seine by rallying Duke Beppolène. In 587, he managed to capture the towns of Angers, Saintes, and Nantes. Fredegund then offered to negotiate peace and sent ambassadors to Guntram. But they were arrested and Guntram severed relations with Neustria, approaching Brunhilda and Childebert II, with whom he concludes the pact of Andelot: agreeing that upon the death of one of the two kings, the other would inherit his kingdom. In 592 Guntram dies and Childebert becomes king of Austrasia and Burgundy. The Austrasia-Burgundy union lasted only until 595, when the death of Childebert II brought it to an end. His realm was then split between his two sons: Theudebert II inherited Austrasia, while Theuderic II received the kingdom of Burgundy. The two brothers then campaigned united against their cousin Chlothar II of Neustria, but their alliance lasted only until 599, when they took up arms against each other. In 593, although only as a symbolic presence since he was only nine years old, Clothar II appears at the head of his army which routs the Austrasian Duke Wintrio invading Neustria. In 596 he continued on to raid the outskirts of Paris, establishing himself further as a capable ruler. Fredegund died in 597, leaving Clothar to rule over Neustria alone. In 599, he made war with his nephews, Theuderic II of Burgundy and Theudebert II of Austrasia, who defeated him at Dormelles (near Montereau), forcing him to sign a treaty that reduced his kingdom to the regions of Beauvais, Amiens and Rouen, with the remainder split between the two brothers. At this point, however, the two brothers took up arms against each other. In 605, he invaded Theuderic's kingdom, but did not subdue it. He remained often at war with Theuderic until the latter died in Metz in late 613 while preparing a campaign against him. In 604, a first attempt to reconquer his kingdom ended in failure for Clothar. His son Merovech, 4 years old at the time, was taken prisoner by Theuderic at the Battle of Étampes and was murdered at the order of Brunhilda by Bertoald. Clothar agreed that he would become the godfather of Theuderic's son in 607, naming him Merovech. Around the same time, Theuderic, seeking a marriage to the Spanish Visigoth princess Ermenberge, daughter of King Witteric, created new political tensions. Witteric then negotiated with Clothar II for an alliance, as well as Agilulf, King of the Lombards. The coalition against Theuderic does not appear to have been followed by significant effects. In 610 Theudebert and Theuderic entered into a war. Theudebert won initial victories in 610, which led Theuderic to approach Clothar, promising to return northern Neustria to him for his aid. Theudebert was crushed in 612, at the battles of Toul and Tolbiac, near Cologne. As agreed, Theuderic ceded northern Neustria to Clothar, but then turned around and organized an invasion of Neustria. However he died of dysentery in Metz in 613. His troops dispersed immediately, and Brunhilda placed her great-grandson Sigebert II on the throne of Austrasia. At that time, Warnachar, mayor of the palace of Austrasia, and Rado, mayor of the palace of Burgundy, abandoned the cause of Brunhilda and her great-grandson, Sigebert II, and the entire realm was delivered into Chlothar's hands. Brunhilda and Sigebert met Chlothar's army on the Aisne, but the Patrician Aletheus, Duke Rocco, and Duke Sigvald deserted the host and the grand old woman and her king had to flee. In the battle, Clothar personally slew Bertoald, finding revenge for the murder of his son years before. They got as far as the Orbe, but Chlothar's soldiers caught up with them by the lake Neuchâtel. Both of them and Sigebert's younger brother Corbo were executed by Chlothar's orders, then proceeded to execute many of the family members of this house except Merovech, his godson, and perhaps Childebert who had fled. Brunhilde was accused of murdering ten members of the Neustrian royal family, as well as other Frankish royalty, and was tried and convicted. She underwent a very severe torture and execution by being dragged on the back of a horse and drawn-and-quartered. After this victory, Clothar was left as the sole royal ruler of the Frankish peoples and consolidated his power. Upon his unification of all Franks, Clothar took up residence in Paris and in the villas of Alentours. An important key aspect that was maintained in all three administrations of the kingdoms even after unification was the presence of the Mayors of the Palace. The mayor of the palace was originally the king's servant in charge of administrative events of the palace. During the royal feud, however, the role grew in importance as more of a steward of lands to care more directly than the king could and was placed in the hands of aristocracy. One of the most notable figures in this role was Warnachaire, mayor of the palace of Burgundy in 613, who was one of the leaders responsible for capturing Brunhild, and held the position until his death in 626. Warnachaire's wife, Berthe, was likely a daughter of Clothar. In 614, Chlothar II promulgated the Edict of Paris, a sort of Frankish Magna Carta that reserved many rights to the Frankish nobles while it excluded Jews from all civil employment for the Crown. The ban effectively placed all literacy in the Merovingian monarchy squarely under ecclesiastical control and also greatly pleased the nobles, from whose ranks the bishops were ordinarily exclusively drawn. Article 11 of the Edict states that it is to restore "peace and discipline in [the] kingdom" and "suppress rebellion and insolence". The edict for was ratified for all three kingdoms. Due to several abuses of powers by officials, many of whom had been appointed by Chilperic, several mandates were made, among them the requirement that officials must have come from the region they officiate over. Chlothar was induced by Warnachar and Rado to make the mayoralty of the palace a lifetime appointment at Bonneuil-sur-Marne, near Paris, in 617. By these actions, Chlothar lost his own legislative abilities and the great number of laws enacted in his reign are probably the result of the nobles' petitions, which the king had no authority not to heed. In 623, he gave the kingdom of Austrasia to his young son Dagobert I. This was a political move as repayment for the support of Bishop Arnulf of Metz and Pepin I, mayor of the palace of Austrasia, the two leading Austrasian nobles, who were effectively granted semi-autonomy. 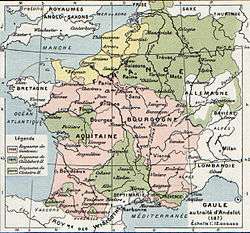 At the same time, Clothar made territorial changes by assigning the region of Reims to Neustria. But Dagobert, now the semi-autonomous king of Austrasia, negotiated its return in 626. 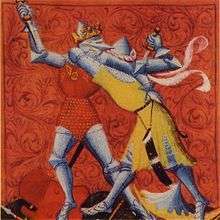 Clothar was no exception in the line of Merovingians of its history of family feuding. This was considered to be a vary 'barbarian' custom. However, he was one of the few Merovingians that did not practice polygamy, instead remaining faithful to a single wife until her death. He remained respectful of the Church and its doctrines, keeping it as an ally. He likely tried to maintain himself as a pious king, inspired by the holiness of his uncle Guntram who had protected him and allowed him the throne. In 617, he renewed the treaty of friendship that bound the Frankish kings with the kings of the Lombards. He likely had the policy of maintaining good relations with Christianized-barbarian peoples so long as they kept good relations themselves with the Church. Clothar died on 18 October 629 at age 45, and was buried, like his father, in the Saint Vincent Basilica of Paris, later incorporated in the Saint- Germain -des- Prés. 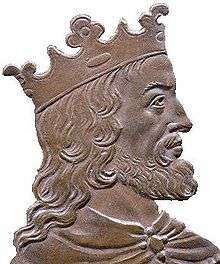 His rule lasted longer than any other Merovingian king save for his grandfather Chlothar I. He left the crown greatly reduced in power, with more power resting among the nobles, and paved the way for the rise of the mayors and the rois fainéants. The Neustrian aristocracy chose King Caribert, the half-brother of Dagobert, as king. However, Dagobert was supported by the Austrasians and Burgundians, and soon reigned over all three domains. Caribert formed his own kingdom composed of Aquitaine territories. 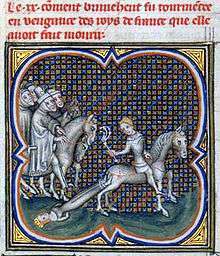 Merovech, who was sent Landéric, mayor of the palace of Neustria, to avoid Austrasien Berthoald at Arele in 604, but was caught and killed. Emma, married in 618 to Eadbald († 640), King of Kent. Though recently it has been suggested that she may have instead been the daughter of Erchinoald, mayor of the palace in Neustria. A son who died in infancy in 617. 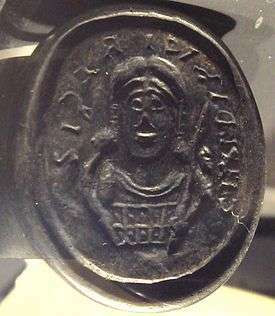 Bertha, wife of Warnachaire († 626), mayor of the palace of Bourgogne. Charibert II († 632), king of Aquitaine. ↑ Grégoire de Tours, Historia Francorum, VII. ↑ Prætextatus (Bishop of Rouen) married Brunhilda and Merovech, so making an enemy of Fredegund. ↑ Fastes juifs, romains et françois [by J.B. Mailly]. ↑ This is not logical: why was he at war with Neustria after having given up the territories? It would be more logical that he was at war because he did not want to give them up. ↑ For the mayors of the palace, cf. Lebecq, pages 125-126. ↑ Alan Harding, Medieval Law and the Foundations of the State, (Oxford University Press, 2001), 14. ↑ S. Wise Bauer, The History of the Medieval World: From the Conversion of Constantine to the First Crusade, (W.W. Norton & Company, 2010), 251. ↑ The word used is judex, "judge", that is to say the earl or one of his subordinates. Cf. Lebecq, page 125. ↑ Yorke, Kings and Kingdoms, p. 29. ↑ Rollason, Mildrith Legend, p. 9. 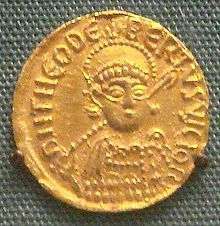 Wikimedia Commons has media related to Chlothar II. Christian Settipani, The Prehistory of the Capetians (New genealogical history of the august house of France, vol. 1), ed. Patrick van Kerrebrouck, 1993 (ISBN 2-9501509-3-4), p. 92-100. Jean-Charles Volkmann. Known genealogy of the kings of France, Gisserot Publishing, 1999 (ISBN 2-877472086). Noelle Leca Deflou - Alain Dubreucq (ed. ), Societies in mid-late sixth - ninth century Europe. Atlande, coll. Key Contest 2003 ( biographies : " Chilperic ", " Fredegonde ", " Brunhild "), 575 pp. (ISBN 9782912232397 ) . Ivan Gobry, Clothar II, Editions Pygmalion al. " History of the Kings of France ", 2005 (ISBN 2-85704-966-8 ) .